My family is big on eating out. My Mam, Sister, my nieces and I will often meet up for a meal, in fact everything we do revolves around food. When we visit a museum or a park it will take about 5 seconds before we’ve worked out where the cafe is and are scoffing down an early lunch, sometimes bold as brass before we’ve even entered the attraction we’ve travelled to see. Every meal had the same rythmn to it as well, we’ll get the menus out and pretend to agonise over them then we’ll ask each other what we’re thinking about having, we’ll answer and then invariably someone will say, ‘I can’t decide between a and b’ and someone else will reply ‘well why don’t I get a and you get b and we’ll share?’. Then a collective sigh of relief will go around the table as we realise we will not have to worry that someone else’s meal looks better than ours. Then we’ll eat our meals, my nieces won’t finish theirs and their plates will get passed along the table to me and I’ll polish off the last of their dinners. After that the dessert menu will come we’ll each claim that we can’t fit anything else in but will have a look anyway, then we’ll agonise over it asking each other about every last choice, ‘should I get cream or custard?’, ‘do you think the carrot cake will be nice here’, ‘I’ve got a brownie in the cupboard at home would it be bad to get one here as well?’. Each question will be considered and dissected seriously by each member of the family until we order exactly what we knew we were going to order when we spied the dessert board on the wall at the beginning of the meal. This happens EVERY TIME and it’s wonderful, it’s familiar and comforting and just the way we do things. So when my Mam text me earlier in the week inviting me for Sunday Dinner I was a bit nervous, where could we go that everyone would be happy? My Mam is a veggie but my sister (and she asked to be described in this way) is a ‘dedicated meat eater’ so where could we go for dinner to cater for everyone? 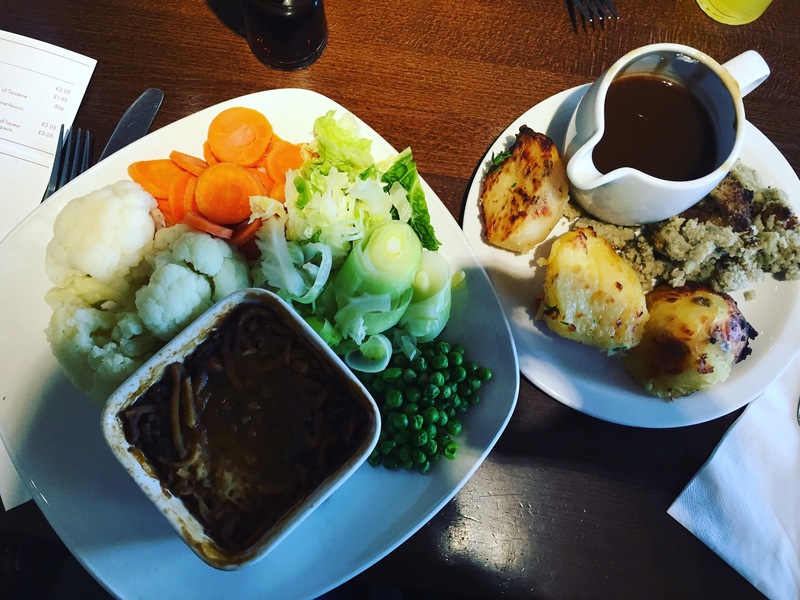 The answer came in a quite unusual place, Toby Carvery. As an establishment famed for its meat, where the house special is. literally four different meats slapped on a plate, I was delighted to see it not only catered for vegans but was expectionally vegan friendly. For a start there are three, yes THREE vegan mains to choose from. 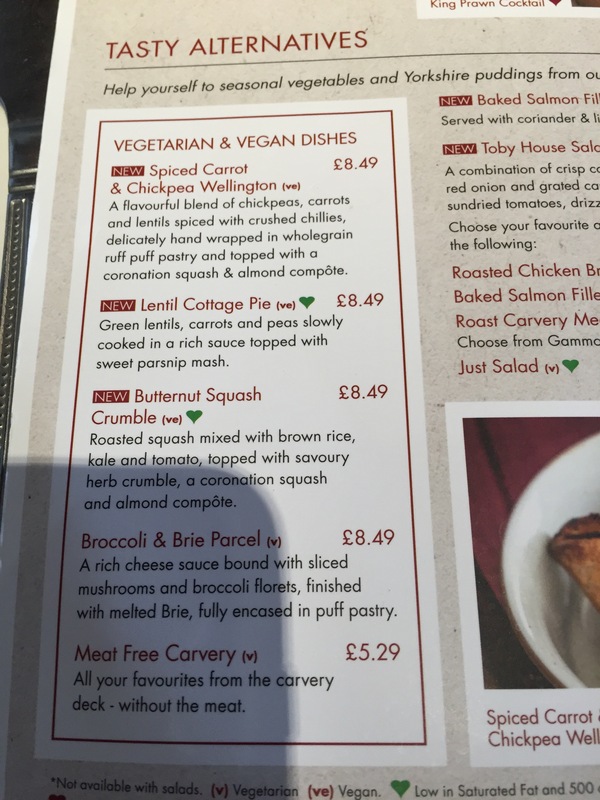 I then asked what else was vegan and the waitress said that she would bring me some steamed vegetables, roast potatoes, stuffing and vegan gravy. She even said she’d bring them to the table so I wouldn’t have to go to the Carvery where all the meat was, this wasn’t really necessary but was incredibly sweet and a gesture that was much appreciated. She brought me SO MUCH FOOD. So much food that it had to go on two plates. The pie itself could have been a meal. Let’s have a closer look at that pie. I wish this was tastevision because this was pie was a true delight. It was packed with flavour and the texture was perfect. The roast potatoes also deserve a shout out because they were cooked beautifully, crisp and tasty on the outside, fluffy and creamy on the inside. Yum!! I did miss having a Yorkshire pudding but I just stole some of the pastry off my Mams pie and that hit the spot. I ate solidly for about twenty minutes but I was defeated by the portion size. It was just too big. 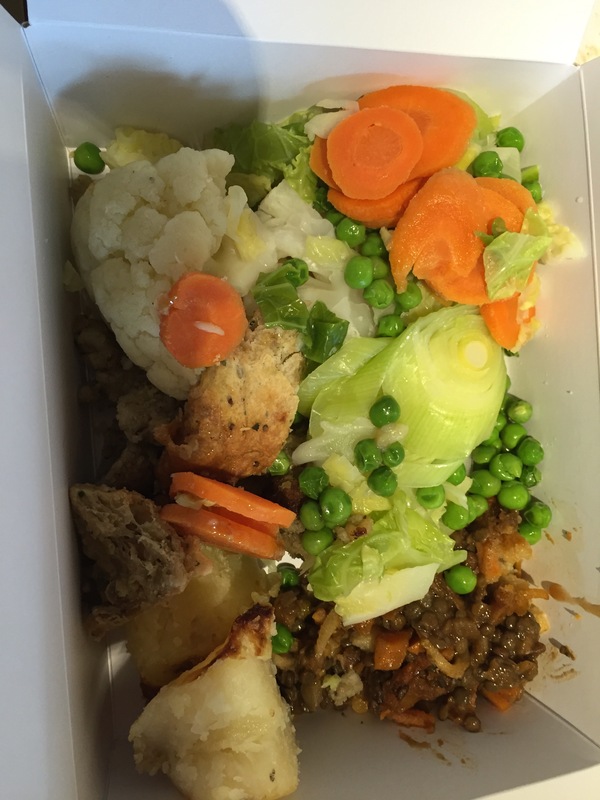 However I was not letting this go in the bin, the waitress gave me a takeaway box and I filled it right to the top with what was left on my plate and it fed both me and my husband in the evening. As you all know, there is always room for dessert. 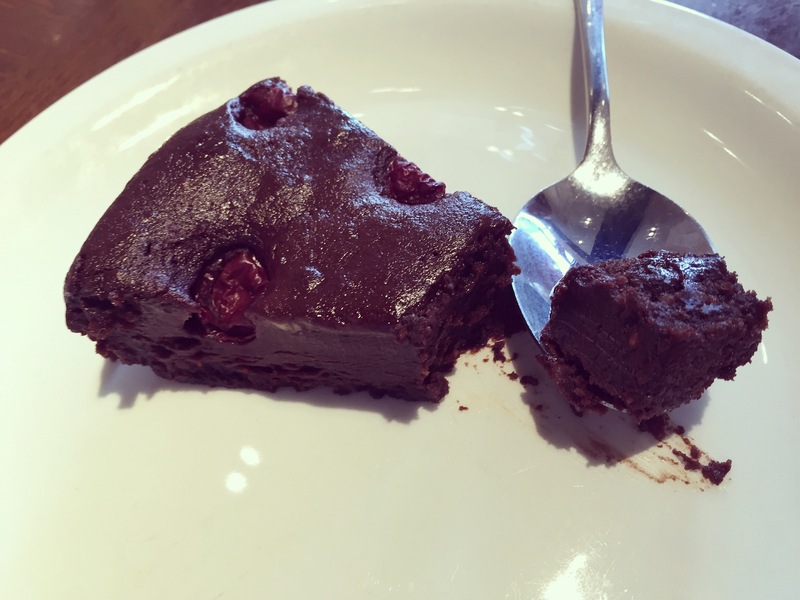 The pudding stomach is real and when presented with the option of a vegan chocolate and cherry tart, well it’s going to be utilised. 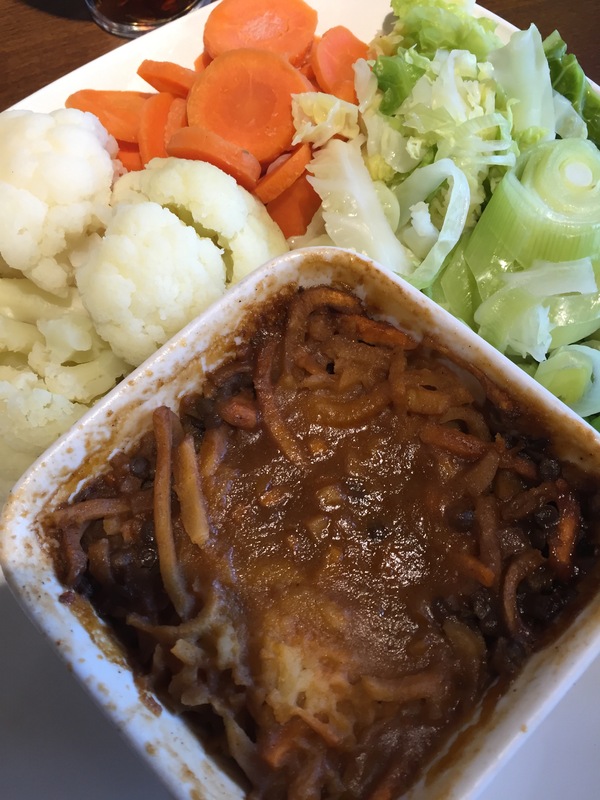 Afterwards whilst we were clutching our bellies and trying not to slip into a food coma, my sister claimed that if she came back she would get the vegan lentil pie as it was nicer than her meat! The only thing I missed was not being to eat my nieces leftovers, but what is my loss is my Mams cat’s gain as my Mam had no qualms about wrapping a whole chicken breast in a serviette and plopping it into her handbag. I was genuinely surprised at how good the Toby Carvery was and it will no doubt become the scene for many fake deliberations over the menu for years to come. What’s your favourite place to eat out with your family?